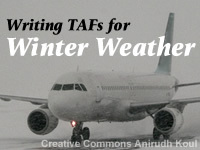 "Writing TAFs for Winter Weather" is the fourth unit in the Distance Learning Aviation Course 2 (DLAC2) series on producing TAFs that meet the needs of the aviation community. In addition to providing information about tools for diagnosing winter weather and its related impacts, the module extends the Practically Perfect TAF (PPTAF) process to address an airport’s operational thresholds. By understanding the thresholds at airports for which they produce TAFs, forecasters will be better able to produce a PPTAF. The unit also examines how to communicate effectively the logic and uncertainty using the aviation forecast discussion (AvnFD) and addresses maintaining an effective TAF weather watch and updating the TAF proactively. The graphics used were very hard to read making it difficult.